Definition at line 277 of file ThreadSafetyTIL.h. Definition at line 321 of file ThreadSafetyTIL.h. Definition at line 322 of file ThreadSafetyTIL.h. Definition at line 315 of file ThreadSafetyTIL.h. Referenced by clang::threadSafety::til::PrettyPrinter< StdPrinter, std::ostream >::printSExpr(). All basic block instructions have a unique ID (i.e. virtual register). Definition at line 311 of file ThreadSafetyTIL.h. Referenced by clang::threadSafety::til::PrettyPrinter< StdPrinter, std::ostream >::printBBInstr(), clang::threadSafety::til::PrettyPrinter< StdPrinter, std::ostream >::printSExpr(), and clang::threadSafety::til::PrettyPrinter< StdPrinter, std::ostream >::printVariable(). Definition at line 281 of file ThreadSafetyTIL.h. Referenced by clang::threadSafety::til::Variable::classof(), clang::threadSafety::til::Future::classof(), clang::threadSafety::til::Undefined::classof(), clang::threadSafety::til::Wildcard::classof(), clang::threadSafety::til::Literal::classof(), clang::threadSafety::til::LiteralPtr::classof(), clang::threadSafety::til::Function::classof(), clang::threadSafety::til::SFunction::classof(), clang::threadSafety::til::Code::classof(), clang::threadSafety::til::Field::classof(), clang::threadSafety::til::Apply::classof(), clang::threadSafety::til::SApply::classof(), clang::threadSafety::til::Project::classof(), clang::threadSafety::til::Call::classof(), clang::threadSafety::til::Alloc::classof(), clang::threadSafety::til::Load::classof(), clang::threadSafety::til::Store::classof(), clang::threadSafety::til::ArrayIndex::classof(), clang::threadSafety::til::ArrayAdd::classof(), clang::threadSafety::til::UnaryOp::classof(), clang::threadSafety::til::BinaryOp::classof(), clang::threadSafety::til::Cast::classof(), clang::threadSafety::til::Phi::classof(), clang::threadSafety::til::Terminator::classof(), clang::threadSafety::til::Goto::classof(), clang::threadSafety::til::Branch::classof(), clang::threadSafety::til::Return::classof(), clang::threadSafety::til::BasicBlock::classof(), clang::threadSafety::til::SCFG::classof(), clang::threadSafety::til::Identifier::classof(), clang::threadSafety::til::IfThenElse::classof(), clang::threadSafety::til::Let::classof(), clang::threadSafety::til::EqualsComparator::compare(), clang::threadSafety::til::MatchComparator::compare(), clang::threadSafety::til::Comparator< MatchComparator >::compareByCase(), clang::threadSafety::til::ThreadSafetyTIL::isTrivial(), clang::threadSafety::til::PrettyPrinter< StdPrinter, std::ostream >::precedence(), clang::threadSafety::til::PrettyPrinter< StdPrinter, std::ostream >::printApply(), clang::threadSafety::til::PrettyPrinter< StdPrinter, std::ostream >::printBBInstr(), clang::threadSafety::til::PrettyPrinter< StdPrinter, std::ostream >::printCall(), clang::threadSafety::til::PrettyPrinter< StdPrinter, std::ostream >::printFunction(), clang::threadSafety::til::PrettyPrinter< StdPrinter, std::ostream >::printSExpr(), and clang::threadSafety::til::Traversal< Self, VisitReducerBase >::traverseByCase(). SExpr objects cannot be deleted. Definition at line 297 of file ThreadSafetyTIL.h. SExpr objects must be created in an arena. Set the basic block and instruction ID for this expression. Definition at line 318 of file ThreadSafetyTIL.h. Definition at line 328 of file ThreadSafetyTIL.h. Referenced by clang::threadSafety::til::SCFG::computeNormalForm(), and clang::threadSafety::til::simplifyIncompleteArg(). Definition at line 326 of file ThreadSafetyTIL.h. 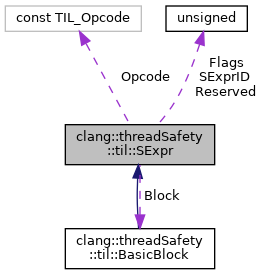 Referenced by clang::threadSafety::til::BinaryOp::BinaryOp(), clang::threadSafety::til::Cast::Cast(), and clang::threadSafety::til::UnaryOp::UnaryOp(). Definition at line 324 of file ThreadSafetyTIL.h. Definition at line 325 of file ThreadSafetyTIL.h. Definition at line 327 of file ThreadSafetyTIL.h.